This is one of my all time favourite desserts – chocolate eclairs! Delicate and delicious, I’m sure these will become one of your favourites too. I personally love chocolate eclairs, but you can use this recipe to make other flavours. My favorite alternative is coffee, which you can make by substituting coffee extract for cocoa powder (to taste, depending on how strong you like your coffee flavour). You can also make a vanilla eclair by removing the cocoa. These eclairs taste best when chilled for an hour or two in the refrigerator. While they probably won’t last long enough to find out, they will get soggy if you don’t eat them in the first day or two after you make them. So, find a free afternoon and try this recipe, and if you run into any problems leave me a comment and I’ll help you out. Chocolate eclairs Parisian style. Learn how to make authentic chocolate eclairs: the choux pastry filled with a chocolate-y crème pâtissière. Heat up the water, butter and salt in a pan and mix gently. As soon as it comes to a boil, take the pan off the heat, and pour in all the flour at once. Stir with a wooden spatula until it comes together and there are no more lumps. The resulting dough is called 'panada'. Next, to dry off the panada, put it back on medium heat, stirring with a wooden spatula, until the paste comes away from the sides of the saucepan and forms a ball. You should also see a thin layer “burnt on” to the bottom of the pan. Transfer the preparation to your mixer, and beat for a minute or two with the paddle attachment to let it cool down. You will know you are ready to move on when it is no longer steaming. This is important as it will make the mixture more “airy” which will make it rise in the oven, and cool it down enough so that the eggs that you add next don't cook as soon they are added to the panada. One by one, incorporate the eggs, with the stand mixer set on low speed. The exact amount of egg will depend according to what eggs/flour you use. What you need to look for is the right consistency, which I've described below. Once you reach the right consistency, stop adding eggs or the mix will be too liquid and the dough will not rise. To know whether you’ve reached the right dough consistency: If you dip your finger in cold water and drag it through the choux paste, you should end up with a line that slowly closes. If it doesn’t close, it means that you need to add more egg mix and if it closes to fast you’ve added too much liquid and need to start over. 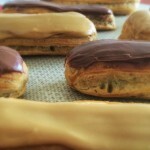 Pipe the eclairs with a 15-16 mm (0.6 inches) nozzle (with teeth) onto a baking sheet, arranging them into staggered lines. Their length should not exceed 12 or 13cm (5 inches). Add a little bit of egg wash to the eclairs then bake in a preheated oven at 180°C (355 F) until golden and hollow (about 40min, but it will depends on your oven). DO NOT OPEN the oven during the first 25min or the dough will collapse. In a mixing bowl, combine the sugar with the egg yolks. Beat the preparation in your mixer with the whisk attachment (you can also do this by hand with a whisk) until it about twice its original volume and becomes fluffy and looks a bit a whiter. Add the Maizena (corn starch) and continue mixing until it is completely incorporated. In a saucepan, bring the milk and the cut vanilla pod to a boil. When the milk starts boiling, pour it in two batches (first time add about a cup, and second time add the rest) over the egg mix, stirring constantly with a whisk. Transfer the preparation back into the saucepan used to boil the milk and cook over medium heat for 3 minutes, stirring constantly. Make sure that the cream does not stick to the bottom of the pan. Once the cream starts to thicken, count 30 seconds and remove it from the hob. You know it is ready if you quickly swirl the mix in a circle with your spatula, remove your spatula, and the cream stops spinning immediately. If it keeps spinning, then it needs a bit more cooking. Transfer the preparation into the stand mixer bowl and beat at low speed. Either add the dark chocolate straight to the still hot cream (it will melt easily) or melt it separately and add to the cream. When the chocolate is fully incorporated, pour the mix into a tray lined with cling film. Cover the surface of the cream with cling film whilst trying to remove as many air bubbles as possible (the cling film should be in direct contact with the cream to avoid the formation of a crust). Let the mix cool in the fridge and whisk again before use (so that it’s softer). With the tip of a knife or a filling nozzle, pierce the underside of each eclair in three places. This is so that your creme patissiere can completely fill the choux pastry. Pour the chocolate preparation into a piping bag fitted with a filling nozzle (6 or 8mm diameter). Place the tip of the nozzle inside one of the holes you pierced then gently squeeze the bag, gradually removing the nozzle. Repeat the operation for each hole in the eclair until the choux pastry is completely and evenly filled with chocolate cream. If some filling is coming out of the choux pastry, wipe it off. Soften the fondant icing over a bain-marie. To ensure a glossy effect, the temperature should not exceed 37 °C (98F). Add one tablespoon of cocoa powder first, then add a second one if necessary. The amount of cocoa powder varies according to the desired flavour intensity. Combine gently with a spatula... until the chocolate is fully incorporated and there are no more lumps. If the mix is too dense add a little bit of water – careful though, if you add too much water, the icing will crack and melt in the fridge. Apply the fondant onto the chocolate eclairs and...Bon appétit! Hello, my name is Nathalie and I love to bake! Through this blog, I’d like to share my favourite recipes, as well as to give my tips & tricks on how to master them. Subscribe to my newsletter to receive all my latest recipes and baking tips! Subscribe to my newsletter to receives all my latest recipes and baking tips!